Creates a high level of user agility with making decisions by simply navigating through a volume of changes and accessing decision data elements. 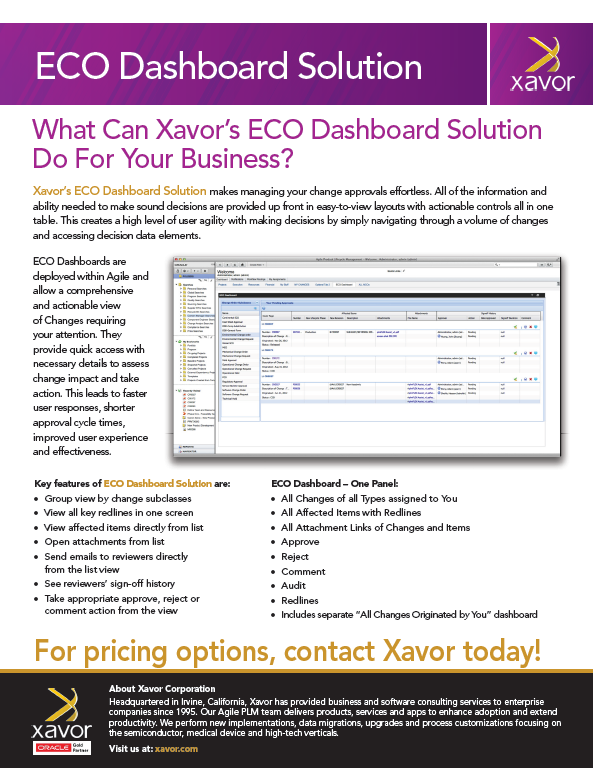 Xavor’s ECO Dashboard Solution makes managing your change approvals effortless. All of the information and ability needed to make sound decisions are provided up front in easy-to-view layouts with actionable controls all in one table. This creates a high level of user agility with making decisions by simply navigating through a volume of changes and accessing decision data elements. ECO Dashboards are deployed within Agile and allow a comprehensive and actionable view of Changes requiring your attention. They provide quick access with necessary details to assess change impact and take action. This leads to faster user responses, shorter approval cycle times, improved user experience and effectiveness.